Calculated fields allow you to create pivot table fields that carry out calculations. A common example might be multiplying a number by a percentage to calculate taxes. Our Expert Skills Books and E-books explains calculated fields in depth, but this article focuses on modifying and deleting calculated fields that already exist. The Insert Calculated Field dialog appears. 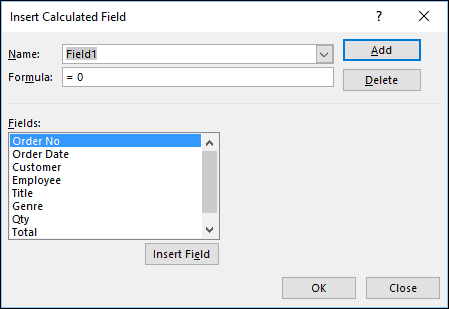 When it first appears, the dialog is ready to insert a new calculated field called Field1. It’s not immediately obvious whether there are any existing calculated fields or how to access them. If you click the drop-down arrow next to Field1 you will see a list of all of the existing calculated fields, allowing you to select them. There’s only one existing calculated field in the example workbook, named Bonus. 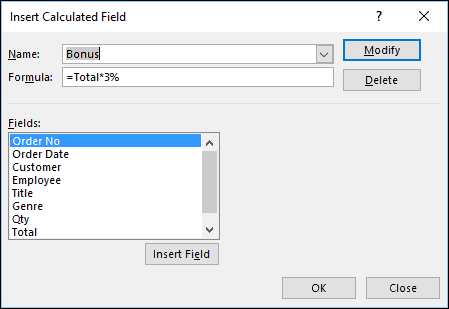 After selecting the Bonus calculated field you can see that it is currently calculating 3% of the Total field. You’ll also notice that the Add button changes to say Modify. 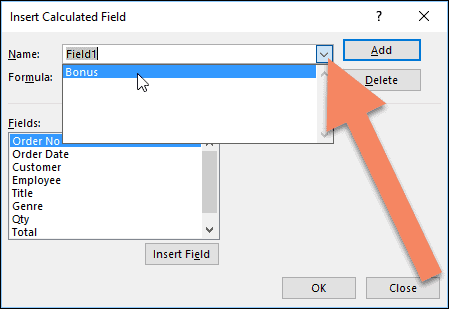 You can now change the formula that is used by the calculated field and click Modify to save your changes or click Delete to delete the calculated field. You’ll find much more about pivot tables and calculated fields in our Expert Skills Books and E-books, including a complete explanation of the new OLAP pivot tables. It could be of great benefit to anyone who needs to work with pivot tables often.